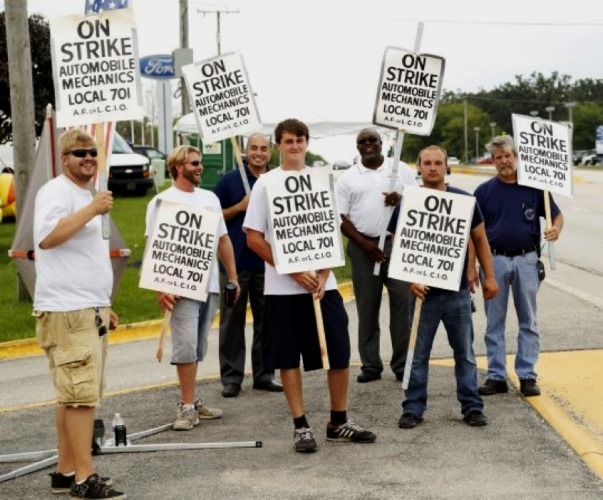 Members of IAM Automobile Mechanics Local 701 members strike Piemonte Chevrolet in east Dundee, IL, for fair wages, benefits and working conditions. Unions representing 500,000 members in Chicago and Cook County, IL rallied in East Dundee, IL, to support the IAM Automobile Mechanics Local 701 members on strike at Piemonte Chevrolet. The auto mechanics say they aren’t asking for much. They want the same wages, benefits, working conditions and respect provided at two other local Piemonte stores. Watch the “Local 701 Strike Rally” video.